At 11 p.m. this date in 1946, White general turned Japanese collaborator Grigory Semenov (or Semyonov) was hanged for a generation’s worth of anti-Soviet depredations in the Far East. 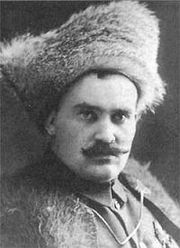 The tsarist officer Semenov joined the Russian Civil War as a notoriously vicious White commander with the grandiosely retro title of Ataman of the Baikal Cossacks. According to G. Patrick March, Semenov’s “penchant for killing, torturing, and looting” extended to executing a captured socialist by tossing the man into his locomotive’s fuel chamber. Although also a rival in the suicidally fractious White political jostle, Semenov was the designated successor of Aleksandr Kolchak when the latter was shot in 1920, but by that time there wasn’t much left to succeed. Knocking around the interwar era in gloryless exile, Semenov was an easy recruit for the Japanese war machine, which was in the market by the late 1930’s for locals with command experience and a grudge against Moscow and put him on retainer in Manchuria. Like the Soviet-Japanese front in general after Khalkin Gol, nothing much came of that enterprise; the Ataman’s last great hurrah was but a footnote for Japan, and his death would be a footnote in the annals of postwar victors’ justice.